Post your Sunday School art and cooking lessons, ideas, activities, and resources for Jesus Calms the Storm. Bible lessons and ideas about Jesus Calms the Storm -with Cooking, Food, Bible Foods, Recipes, Baking, Preparation, Art, craft, painting, construction, drawing, etc. Weird I know, but the kids totally loved this idea and it goes home to remind them of the story. Have the kids read the three different versions of the story from Matthew, Mark and Luke. After they vote, go to someone on each side and ask them why they voted the way they did ....to promote discussion! Pretending whatever it was that was scaring me wasn't there! Prayer for Problems.... Go around and ask for a few volunteers to tell what their "storm" is. Make a mental note of those who seem to have a substantial problem. Have everyone write their problem they are "afraid" of on a slip of paper. Seal the slips in an envelope that has a picture of a boat and waves. Offer the content of the envelope to Jesus in a prayer. Tell the kids you'll give the envelope to the pastor who will read each prayer slip privately and offer a prayer for each. Encourage the kids to talk with the pastor about their problem. Give them his or her phone number. Now, have the kids stay in the three groups they voted themselves into ...and ask each group to come up with two ways they think Jesus can help them when they are afraid. Using clear plastic jars (about the size of a can of peaches), students will create a "snow-shaker" type project that has a boat with Jesus standing in it. The words "Peace, be still." are printed on the side of the jar. Fish shaped metallic paper cut-outs and similar objects (from party/craft store) are sprinkled in the water. Jesus figure is cut out of thin colored foam sheets and glued to the top of a piece of styrofoam shaped like a boat. The trick is to get the boat to stay upright when the kids shake the jar creating a "storm" in it. We experimented and found that a penny makes nice keel ballast. Also, we shaped the styrofoam using regular scissors. Oddly enough, a flat bottom slightly pyramid shaped piece with Jesus glued to the top of the pyramid was the best shape to keep him upright. We used small clear plastic peanut butter jars left over from another project. The lid of the jar was the base of the shaker. An adult put a bead of hot glue to seal the lid onto the jar (and let it cool). The project was a BIG hit over a wide age group! ...but it took some experimenting. The kids shake hard! ...so make sure the "boat" stays together and remains upright. Children will be led through a guided meditation of being on the boat in the storm. They’ll also create a food version of a storm in a jar – pudding. When the pudding is “calm” (sets) they’ll create a boat to float in it, and then eat it while discussing following Jesus and ways to call on Jesus for help. Matthew 8:23-27, Mark 4:35-41, Luke 8:22-25. 1. What was happening before Jesus and the disciples got in the boat? 2. Did this story happen during the day or night? 3. Based on the description, was it a small storm or large storm? 4. When the storm came up, how did the disciples react? 5. What was Jesus doing when the storm began? 6. What did the disciples say when they woke Jesus up? 7. What did Jesus do and/or say to stop the storm? 8. What did Jesus do or say after he stopped the storm? 9. What was the disciples’ response? 10. Based on this story, do you think the disciples trusted Jesus when he was right there with them? Why or why not? Welcome children warmly to your cooking workshop. Introduce yourself. Tell kids what your favorite food to cook/bake is and ask each child to share their name and what their favorite thing to cook/bake is. Let them know that today they will be creating and digging into a fun treat, but first they will be digging into God’s Word. Split the children into three groups. Give each group a worksheet and assign each group a different passage/version of the Bible story on it: Matthew 8:23-27, Mark 4:35-41, Luke 8:22-25. Give each child a Bible. Let them know that the story we’re learning this month is recorded in three of the four gospels and each group will be reporting back to the whole group what they discover. Instruct everyone to read the assigned passage silently to themselves. When everyone in their group has finished reading, they should choose one person to be the recorder. The group will answer the questions together making sure all agree on the answers, having their recorder record their answers on the worksheet. When all groups have finished you will read each question aloud, then have each group respond with their answer, with group members taking turns answering, and note differences and similarities. Skip the split-in-to-groups activity. Use the Mark version of the story (Mark 4:35-41) and read it aloud to the class. Work together on the "worksheet" questions - not writing them on paper but just discussing them. Kids will create a storm in a jar using instant vanilla pudding mix and milk. Have several kids help pour the ingredients (following package instructions) into a large clear plastic jar with a tight lid. Add several drops of blue food coloring (to have the pudding represent water). Explain how we will pass the jar around the circle inviting each of the kids to give it 5 big shakes and while doing so, think of one storm in their life right now (you may have to give examples/idea starters such as “bully at school”, “grandparent’s death, etc.). After they pass the jar to the next person, they take a slip of paper and write a sentence about their storm, then fold the paper and place it in a basket placed in the middle of the table. When everyone has had a turn shaking, invite the children to do a guided meditation. Guided mediation may be a new experience for some children, so be sure to explain the process. You will be asking them to close their eyes and imagine. You will prompt them to imagine hearing, seeing, smelling, feeling, and touching various things. Go back in time with me thousands of years to when Jesus lived. You are someone who used to fish for a living and you live down by the water, by the Sea of Galilee. Today you’re there by the sea and see the boats lined up on the shore, you can hear the sea birds squawking, and you can smell the fish that others have already hauled in. You’re tired. It’s been a long day and it’s starting to get dark outside. You are a follower of Jesus and you and the others have been traveling all over listening to Jesus teach about God’s love and heal people. Do: Start track 2 – soft music. You see Jesus coming towards you. He’s walking slowly and he seems tired, too. There’s a crowd of people following just behind him. Jesus says, “Let’s go over to the other side of the sea.” You want to say “I’m too tired” but there’s something about the way he says it, that you feel you need to obey. So you and the others with you, climb into the closest fishing boat. You help Jesus into the boat. You and a friend pull up the anchor while others pick up the oars and adjust the sails. Jesus moves to the stern of the boat – the back of the boat – and lies down on a cushion. As you set sail heading across to the other side of the lake, you look back and Jesus is asleep. You smile because you feel like you still don’t know much about this amazing man, who seems to love everyone especially you. You can feel a light breeze blowing your hair and clothes. The smell of salt is in the air from the sea. There are birds circling overhead and they squawk every now and then. You’re in a fishing boat and the birds are expecting that you’ll be fishing, but you’re not, you’re just watching the others in the boat, looking off into the distance, and you decide to sit down now and rest. You close your eyes for a moment … maybe you can fall asleep to with the waves gently rocking from side to side. Do: Start track 3 – wave and wind sounds. From nowhere the wind picks up and gets stronger. Soon the boat starts to rock a little harder from side to side and you hear your friends say, “A storm is coming”. They’re rushing around in the boat, trying to let down the sail but the wind is whipping it around. Your clothes are getting wet because waves are now splashing up over the side of the boat. You look out at the sea and just then you’re knocked off your feet and fall down because of a huge wave that crashes into the boat and onto you and your friends. At first you aren’t sure if Jesus is saying “Quiet! Be still!” to you or to the waves and wind. Do: Start track 4 (or repeat track 1) – shore sounds. Jesus looks right into your eyes and says "Why are you so afraid? Do you still have no faith?" Jesus goes back and sits down in the boat. Again, Jesus seems tired and a little sad. The others seem afraid and are asking each other, “Who is this? Even the wind and the waves obey him!" Now, remember how you felt when Jesus stopped the storm after you asked him to help. How are you feeling? Slowly open your eyes. Take a slip of paper in the shape of a boat and write at least two sentences that describe how you’re feeling. While kids are doing this response activity, pass out the bowls of pudding and place the other food items in the center of the table. When kids are finished writing, invite them to the table to create a boat in their pudding sea, using the graham crackers for the bottom of the boat, put a cheese cube on it, insert a pretzel stick into the cube vertically, then use the Fruit Roll-Up to create a sail. 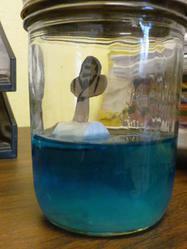 They can make their water choppy or calm with spoons. While they create, play the song on the CD called “Put Your Hand in the Hand of the Man Who Stilled the Waters”! Encourage them to sing along! And then eat their creations! · I wonder … How can you know that God is always with you? · I wonder … If you trust God, will God make nothing bad ever happen to you? · I wonder … What could you do if there isn’t time to stop and pray in a certain situation? · I wonder … Will God always answer prayer? · I wonder … Will God always answer your prayers the way you want them to be answered? Have kids help with clean up. After reading/hearing the story, discuss it through a "voting game" and then discuss things that are ‘storms’ (difficulties) in their lives right now. Different age groups will then create different projects that help them remember this story and how they should respond to "storms" in their lives. 2nd-5th grade -- create a magnet in the shape of a cross – they’ll use paint and marbles in a pan (like a storm!) to decorate the cross. Introduce yourself and tell one quick fact about yourself that will make the kids say ‘Wow!” Tell them that you’ll give them 30 seconds to name (just call out) as many stories as they can from the Bible that have water in them. Read the story called “The Wind That Obeyed” on page 97 in Read Aloud Bible Stories. Be sure to complete the story with the questions/info on pages 125 & 126. Have kids get Bibles. Help them locate Mark in the New Testament – remind them that stories about Jesus are found in the New Testament, stories before Jesus was born are in the Old Testament. Choose a way to read the story together – ideas include silently, with one table reading odd verses and the other evens, you read odd and kids read even, volunteers to read each verse, or whatever way you choose. Show them the pictures in the story book, and ask them to tell the story to you! You begin the story by saying “One day …” and drawing some waves on the white board. Ask who wants to tell the next part of the story (a sentence or phrase) and have them add to the picture next, maybe by draw some stick figures on shore and saying “Jesus and his friends the disciples.” Then let someone else say the next part and draw something, etc. After the story is completed, tell them you have a few questions to ask them but they’re not to answer yes or no, but instead pretend they’re in a boat and if their answer is yes-they should sway to the right; no-sway/rock to the left. The first few questions have yes/no – other questions have 3 options. In those instances, decide to sway to the right for option one, to the left for option two come up with a third option like swaying backwards. 7. Of these three things, what would be the scariest to you? - pretending whatever it was that was scaring me wasn't there! One final question – no voting, use your words to answer this one: Has God ever surprised you? In what way? Kids will create a "Me & Jesus" figure. Use the cardboard/papier-mâché people figures with paints, markers and/or felt pieces to decorate one side to resemble themselves and the other side to resemble Jesus. As they work you can ask questions, give reminders, etc. about Jesus loving them and promising to always be with them in good times and bad. You could give suggestions of those times such as: Is Jesus with you at school? At church? At Home? When you are laughing at a silly joke? When you are sad because you fell and got hurt? And then ask them to add to the growing list of times Jesus is with us … help them to discover that the answer is --- always! Pair off students (they’ll work with a partner.) The Shepherd can pair with a student if you have an odd-number of children. Each pair will choose 4 colors of paint and put a small amount of each color into separate paint cups. They’ll drop one marble into each paint cup and stir/swirl it around so the marble is completely covered with paint. Both partners will put their crosses into a pan/tray. One will place one of the paint covered marbles into the pan and begin tipping the pan back and forth and all around so that the marble rolls over the crosses creating a design. Have them note that they are not quite in control of how the marble goes! It's like a storm! While doing this, that partner should share something that makes them feel a little out of control, scared, worried. They’ll then take that marble out, and put it back in the paint cup. 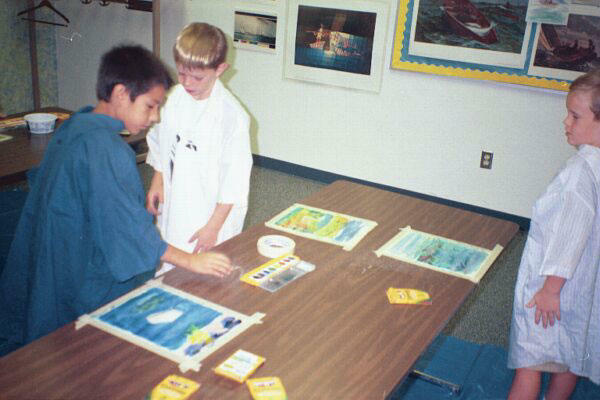 Then have the second partner choose the next color, and repeat the process, being sure to do sharing also. When they’re ready for the 1st partner again and the 3rd marble and paint color, this time they’ll share an idea they have for remembering to go to Jesus when they’re feeling out of control, scared or worried. Then the 2nd partner will repeat with the final marble and color, and their shared idea. When they’re done, have them place their cross on a paper plate and write their name on their plate to take home. Let them know they should wait till the next day to let the paint dry completely. Also provide them with sticky back magnets to apply to the cross when the paint is dry. Go around the group and ask them where they will put their project and what idea they had for how to remember to go to Jesus first and right away for help. Close in prayer that they will follow through on their ideas for help from Jesus. Coleman, Lyman. Serendipity New Testament for Groups: New International Version. Littleton, Co.: Serendipity House, 1987. Print. Lindvall, Ella K. "The Wind That Obeyed." Read Aloud Bible Stories. Vol. 1. Chicago: Moody, 1995. Print. MacQueen, Neil. "Jesus Calms the Storm: Art Workshop." Rotation.org. Web. Students will create using watercolor paints. Recognize that God calms the storms in our lives, sometimes by calming the storm, and sometimes by calming us. Cover tables and set up supplies. Find pictures and paintings of boats, ships, and ocean scenes, especially from the time of Jesus. Read the story from your choice of the passages. Always tell the children where in the Bible the story is found. DEFINITION: Miracle – A wonderful event that shows us the power of God. (For older) – An especially vivid moment when as a result of an unexpected and surprising event one becomes aware of the presence and power of God at work. As the students work discuss "storms" in our lives (anything that causes us to worry or be afraid) and how that God will be with us through all our difficult times. Did Jesus not know that a storm had come up? Does Jesus know about the storms that come up in our lives? What did Jesus do when the disciples woke him? What did the disciples think about this? Close in prayer. Invite the children to come back next week for another workshop, and to bring a friend. Pauer, Lynne and Carol Hulbert. “A Walk on Water: Art Workshop." 2008, 2013. Web. The students will learn about the story of Jesus calming the storm. They will discuss the “storms” in their lives and the ways their faith in Christ can support and sustain them. They will make “worry” cans (small canisters covered in colored papers) and “worry” stones: stones with Biblical verses and messages reminding them that God is always with them; that God calms the storms in our lives sometimes by calming the storm and sometimes by calming us. For our rotation on "Jesus Calms the Storm" we did a wonderful art lesson. This was so powerful for the kids that we also did this in our women's group. I'll attach a copy of the lesson plan as well as post it here. Familiarize yourself with the lesson plan. Gather all the materials for your project. Make sure there are Bibles on the tables for the students. Introduce yourself to the students and tell them something about yourself that is really “WOW”. Say: This morning we are going to be thinking about this month’s story “When Jesus calms the storm” from a different perspective. We are going to focus on how Jesus helps us to calm our own worries and fears. But let’s read the Scripture first. Say: We find this story in the New Testament in the book of Mark. It’s in the Fourth chapter, verses 35-41. Let’s find this passage in our Bibles. (When the students have located the book in the Bible continue.) Mark is one of the Gospel writers. Ask: Can you tell me who the other Gospel writers are? (Mathew, Luke, John). Say: Jesus tells the Disciples that if they have faith they have no need to be afraid. Say: We’re going to take a few minutes to write down some of things that we’re afraid of or things that we worry about. (Pass out the strips of paper and pens. Give the students time to write. When they are done give each of them a canister.) Let’s put our worries and fears in these canisters. We’ll decorate the canisters later. Do you think that if God doesn’t take away the “storm” that He has forgotten you? Say: It may feel that way but it isn’t the truth. It’s important to remember that feelings aren’t facts. It might feel like God hasn’t answered a prayer but God answers all prayer. Something I want you to think about is that if God doesn’t calm a “storm” in your life—if He doesn’t “fix” the thing you are worried about, if He doesn’t change the person who is bothering you, if He doesn’t turn the lights on when you are afraid of the dark—God can still calm the “storm” in you. He can change something in you so that you can feel differently, so that you can fix the problem, so that you can figure how to remain calm until you can figure out what to do. Once upon a time, it began to rain and overflow the river next to a farmer's house. As it rained the water rose higher and higher. Soon the water was up to his front door. "God," said the farmer, "save me!" Ask: What do you think about the farmer? What do you think about what God said? Say: God promises to answer our prayers. God promises to comfort us, save us, calm the storms in our lives. But sometimes, like with the farmer, we may be expecting God to act one way when God is really helping us in another way. 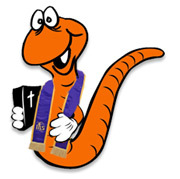 Ask: Do you think coming to church and Sunday school is a way God helps us? Do you think praying is a way God helps us? Do you think having a close family and friends is a way God helps us? Say: When you need to remember that God is with you just open your prayer book and read some of those prayers. This morning we are going to make “worry” stones which will be another way we can be reminded of the ways God is always with us. These are going to be small stones that have words written on them. You can keep them in your canister. When you need one just take it out and read the message. You can hold on to it or keep it in your pocket if you like. The stones are smooth and it can feel soothing to rub them. If you want you can write down a worry or fear, put it in the canister and take out a stone. When the canister is full of papers you can take them out, read through them, and throw out the ones that are no longer worries or fears! You’ve already started your canister. Let’s make the stones. Hand out the paper with messages written on them, a paper plate & stones. Have each student pick a few quotes to start with. If there is enough time they can make more later. The glass stones magnify the quotes. Write their name on the paper plate. Use the glass stones and the quotes, which have been cut to fit the size of the glass stones. Using a small amount of “Modge Podge” glue the quotes onto the back of the stones with the paint brush. Put glue on stone and on the paper once attached. Leave them to dry on the plates until the next week. Mightier than the waves of the Sea; is His love for you. HE saves those who are crushed in Spirit Psalm 4:18.
cover you with His feathers & His faithfulness will be your shield. These are just a sampling of some of the scriptural passages and memes we used. Once the stones have been made have the students choose from the variety of scrapbooking papers, which one they would like to use. Using a glue stick, cover the canister. They can also add a label from among those available. They can take the canisters home with them and pick up the stones the following week. Students will create stormy artwork by using a marbling technique. The artwork will be turned into encouragement cards that serve as a reminder of God’s power, presence and faithfulness within the storms of our own lives. Allow artwork to sit one week to ensure it is completely dry. At the end of your lesson set, collect all of the created cards and place them in the provided basket/envelope. Display them with the included sign on the mailboxes in the church foyer for use by others in the church. If students wish, they may take home one of their cards for their own use! Greet your students warmly, welcoming them to "Thou Art Studio". Introduce yourself and any other adults. Has anyone ever been inside of a terrible storm? Did it cause any damage? Say: We’ve been learning about the story of Jesus calming a huge storm on the Sea of Galilee. Today, we’re going to read the story right from the Bible. As I read I’m going to pause and ask you to tell me what feeling is happening for the character in focus. Do: Read Luke 8:22-25 directly from your Bible. Luke 8:22-23: One day Jesus said to his disciples, “Let us go over to the other side of the lake.” So they got into a boat and set out. As they sailed, he fell asleep. A squall came down on the lake, so that the boat was being swamped, and they were in great danger. Do: Explain to students that up until this point, Jesus had been teaching large crowds about the Kingdom of God and performing miracles. Can you relate to how Jesus felt? Can you bring to mind a time or many times where you have felt this way? Do: Allow a few moments of silence to think about such times. Say: "These truths should help us realize that Jesus was genuinely human with the same basic needs we all have. Christ’s humanity is part of what qualifies Him to be our merciful intercessor between us and God the Father" (From Got Questions). Do: Explain to students that "although the text doesn’t say which apostles were with Christ on the boat, it’s probable that seasoned fishermen (at least four of the twelve) were aboard." Say: "These men were quite familiar with the ways of the sea; certainly, this was not their first squall on the Sea of Galilee, which was known for its sudden raging storms" (From Got Questions). Can you bring to mind a time in your life where you thought there was no way out, no solution, no help? Luke 8:24-25: He got up and rebuked the wind and the raging waters; the storm subsided, and all was calm. “Where is your faith?” he asked his disciples. Why might the disciples have been fearful even though Jesus was with them in the boat? Why do you think the disciples may not have had faith in Jesus? Do: Allow students to provide possible answers to the questions above. Encourage discussion and a variety of possibilities. Say: "The apostles’ lack of faith reminds us that even those who lived and walked with Jesus, saw His miracles, and heard His message still found it difficult to be 100 percent faith-filled all the time. In that way, the disciples were a lot like us. However, their lack of faith was rebuked—and, by extension, so is ours! If Jesus was able to rescue the apostles from the storm, He is also able to rescue us from the storms of everyday life" (From Got Questions). What did Jesus’ miracle of calming the storm teach his disciples about His presence with us during trouble? Do: Allow children to share their thoughts. Say: "When Jesus gave orders to 'go over to the other side,' He knew the storm was coming. He is omniscient [editor's note: He knows everything]; even with a storm brewing, He decided to launch out to sea. The Lord never promised we will never see a storm in life (as a matter of fact, He has told us to expect trouble, John 16:33). Rather, He has promised that He will be with us in the storm. He will never leave His children alone in the midst of trouble; with perseverance they will overcome (Deuteronomy 31:8; James 1:12). What did Jesus’ miracle of calming the storm teach his disciples about who He really is? Do: Allow students to share their thoughts. Say: "This passage not only reveals Jesus’ true humanity, but also Jesus’ deity because only God can make the winds and water obey. With one quick word from Christ, the storm abated and the sea became calm. The apostles marveled at this powerful display of Jesus’ supernatural ability over the elements. This can be immensely comforting to the Christian in a storm. Faith in Christ is never misplaced. If He can calm the storms of the sea with one word, He can calm the storms of life as well " (From Got Questions). What were the disciples feeling after they witnessed Jesus’ miracle? What other words could have been used in place of fear and amazement? Have you ever experienced a time when Jesus answered a prayer for you or provided for a need in the life of someone you know? Say: Think about that time in your mind. Say: Sometimes problems or challenges we face in life are referred to as “storms.” As Christians we know that we don’t have to face these storms alone - we have Jesus with us to tackle any challenges that life may bring. Today we are going to create encouragement cards that can be used to remind people that Jesus is with them through any problems they may encounter. Place a stack of 4-5 sheets of watercolour paper near each child’s tray; once your start swirling the colors you have to work quickly to get the best effects. Pour roughly 3-4 tablespoons of almond milk into a tray; basically enough for a thin layer of milk that covers the bottom of your tray. 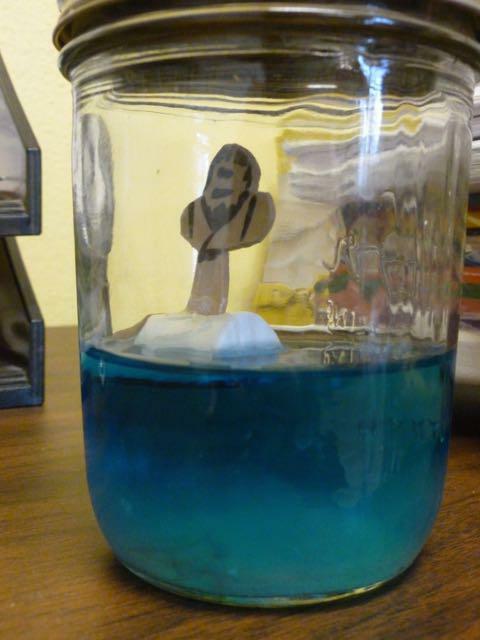 Have students add drops of food coloring around milk. Add a couple dollops of dish soap around the tray. The soap and food coloring will now start interacting. Using a Q-tip or toothpick, begin swirling the colors as though you are creating a stormy sea. Before the colors get too mixed together take one sheet of paper and lay it on top of the milk mixture. Press down. Gently lift it, set aside to dry, and continue with additional sheets. Let everything dry completely. Hold in front of fan to speed up drying. Have students fold artwork in half to create a card. Students can add a scripture promise label to the inside of their card and a “created by...” label to the back. HELPFUL HINTS If paper is warped after drying, place it between two sheets of paper and iron it to flatten it out again. In case you are wondering, after drying for several days the paper doesn’t smell. Pray for the people that came to mind. Pray that Jesus might calm their storm. Pray that their faith might be strengthened to recognize Jesus’ supreme power and faithfulness. What Bible verses did students place on their cards? Was their one verse that spoke to them in a special way about God’s strength, presence or promises in the midst of life storms? Talk about what a difference it might make in someone’s day to receive one of the encouragement cards that was just created. Is there someone that each student can think of to send an encouragement card to? If not now, maybe in the weeks to come God will bring someone to mind. "What Is the Significance of Jesus Calming the Storm?" GotQuestions.org.Web. Summary: Crayon Resist Watercolor Art Students will create a boat and storm artwork by beginning with a crayon drawing that will 'resist' the stormy watercolors. This workshop will reinforce the characteristics of peace and power that Jesus demonstrated. 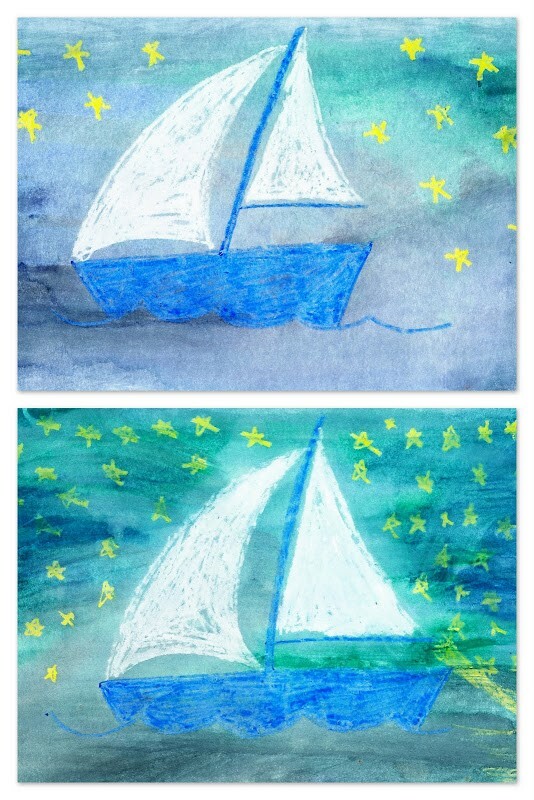 Start by using crayons to draw the sky line, boat, stars etc. (let kids have freedom in what they draw but encourage an ocean scene like in the story). This is a good time to begin wondering about the power of Jesus. Conversation starters: Did Jesus look powerful? Did the disciples know how powerful he was? Was he as powerful as God? How do we know? A storm is coming… I wonder if the crayon or the paint will be stronger? How will we know? 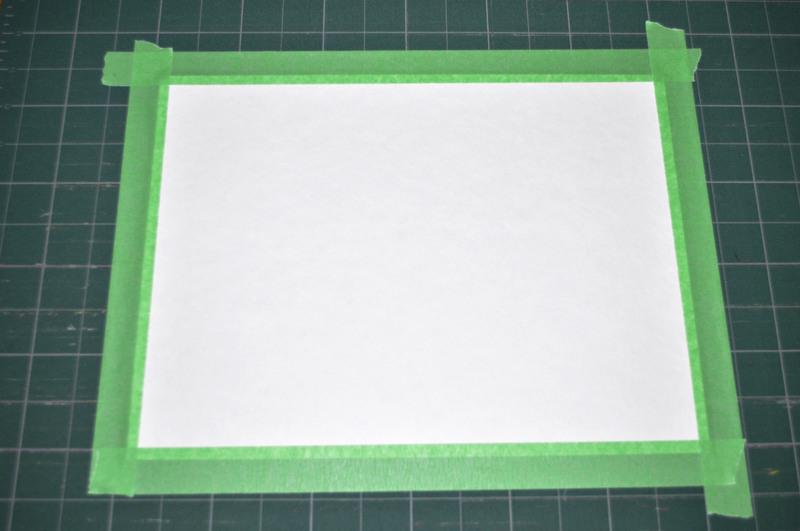 Tape the edges of the paper to the table with masking tape. 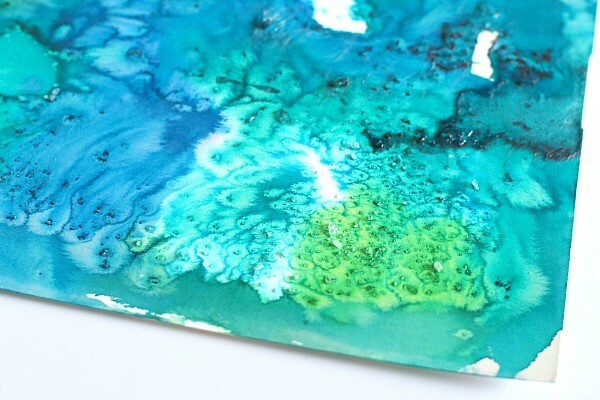 Paint a layer of water over your entire sheet of watercolor paper. Don't skip this step!! This will make the watercolors blend and mix really well! 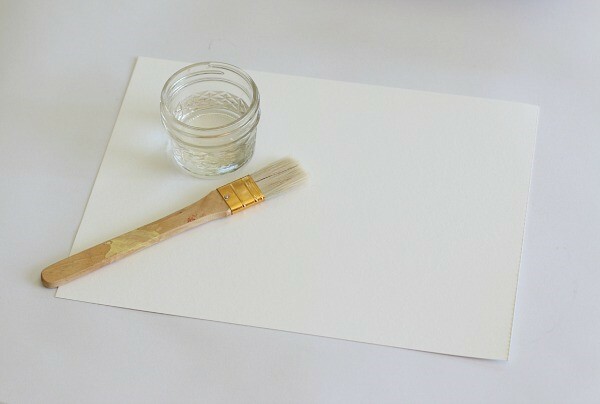 Use a wet paint brush to drop watercolors onto your paper. Blue, turquoise, green, and violet will resemble ocean water and sky. Continue until the paper is completely covered in color. Blend and mix colors. Use the cotton balls to remove the color in places and create unique textures. 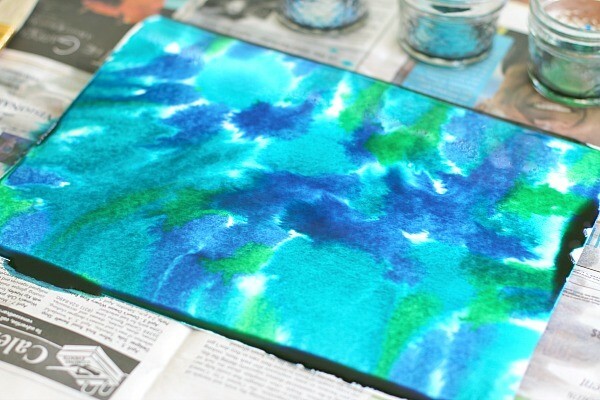 Sprinkle salt onto the painted paper and watch the interesting effect on the wet paint! What an intense storm! But Jesus was there all along... asleep in the back. Jesus showed power over the storm. Peace and power. Look – the crayon resisted the crazy paint storm this whole time. I wonder what the disciples thought when everything was suddenly still. I wonder if they were still afraid? I wonder if they knew who Jesus REALLY was? I wonder if you have ever been in a storm like this? This story is beautiful, isn’t it? 5. Make sure that each painting has the child’s name on it (if it's too wet, leave a note next to the art with the child's name and we can add it later. Leave the art on the tables – DO NOT MOVE THEM – the paints will drip! The children can take their paintings home the following Sunday, once they’ve dried. Conversation starters: What surprised you about this story? What was your favorite part? Jesus has power over the weather... I wonder what else Jesus has control over? The group can carefully walk around the tables to see all the paintings. Encourage each child to share their work with the rest of the class. Never mix paint in the paint wells. Teach the children how to properly rinse their brush before picking up any other paint. If necessary, demonstrate this for students. If you have time, please encourage the children to help clean up (dumping dirty water, rinsing brushes, etc.) The large utility sink in the upstairs men's restroom will be the best sink to use. If you run out of time, feel free to leave the mess until AFTER worship (teachers please return to tidy the room before you leave church for the morning).